Request 1 or more color preference or let us choose for you. These medium pyramid shape earrings have 6 to 7 dangles and measure approximately 3" to 3 3/4" long including silver plated french wire by 5/8" wide at its widest point. 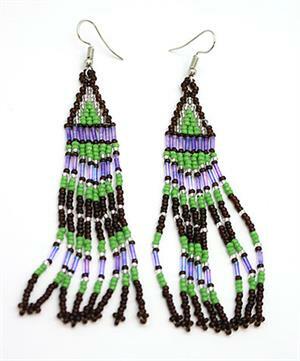 Crafted by Navajo artisan Douglas T. Yazzie. Colors and patterns will vary. Each batch is different. This batch has red's, blues, pinks, purples, orange, black, white or browns. Choose color preference or let us choose for you.